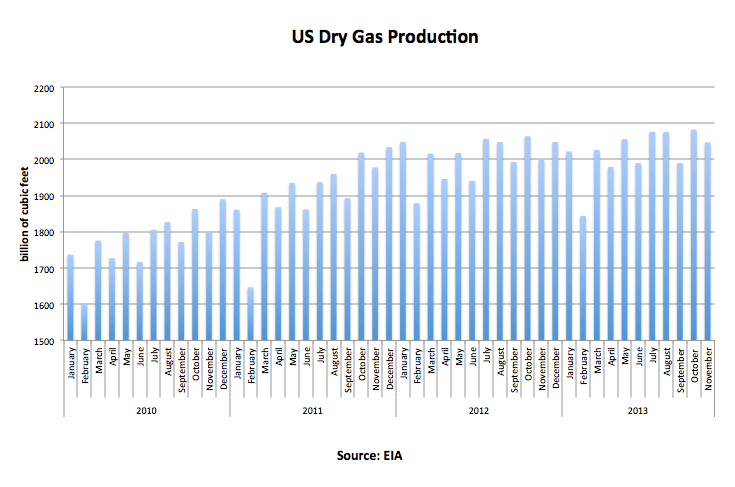 The US government agency The Energy Information Administration reported natural gas production numbers for January 2015 on 31 March (numbers are reported with a two month lag). 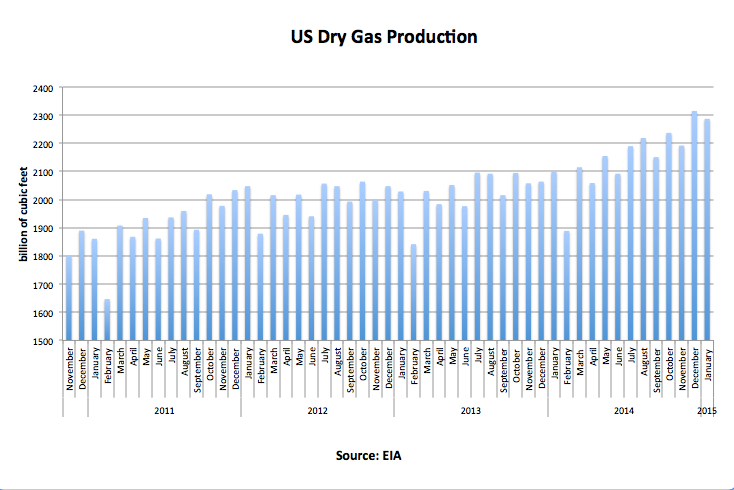 US dry gas production was up 8.9% year on year in January, and the 12-month moving average was 6.1% higher year on year, the highest growth since October 2012 (click for large image; source: here). Meanwhile, natural gas prices have continued to trend down and are now reaching around $2.5 per million British thermal units (Btu). This is not far off their 2012 lows (source: here). 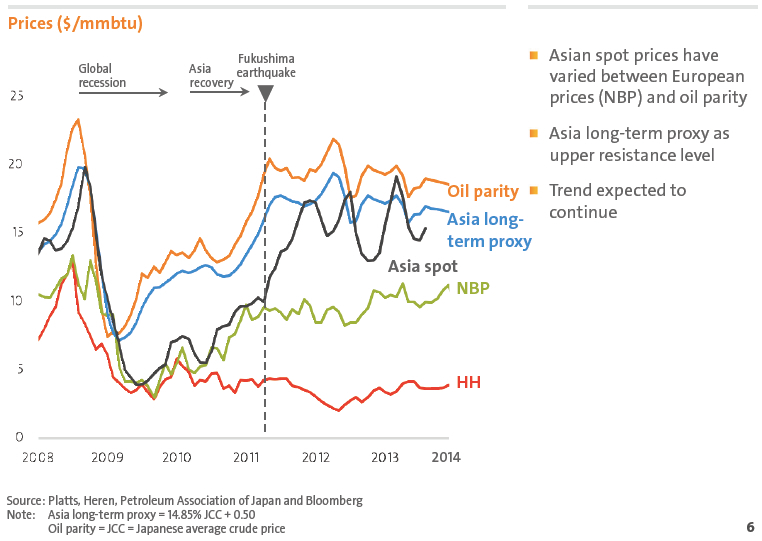 Chart of the Day, 2 Feb 2015: Still Talking about a Shale Gas Revolution? 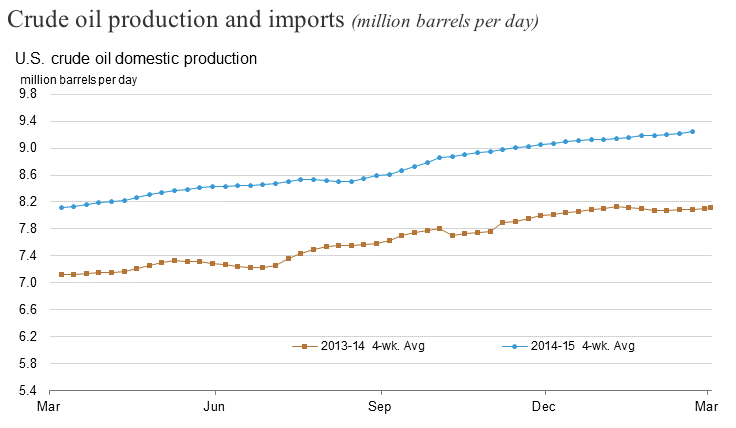 For two years, 2012 and 2013, production almost flatlined, before jumping up again at the beginning of 2014. 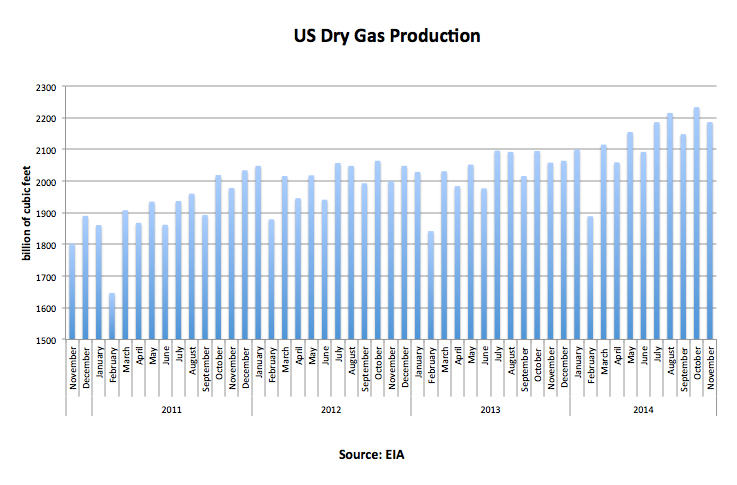 The latest numbers show dry gas production for November up 6.2% year on year, and the twelve month average rose 4.6%. 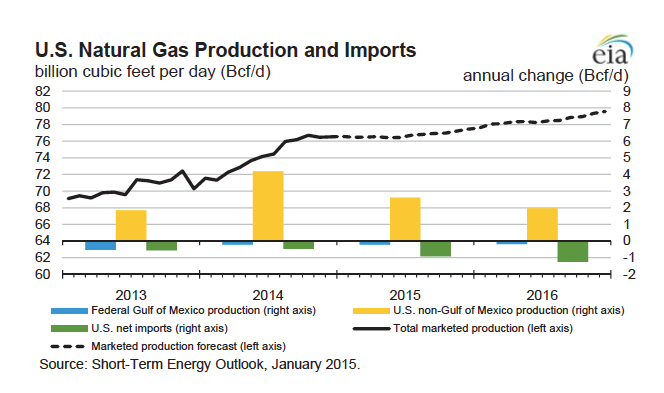 What explains the two-year hiatus in the shale gas revolution? That’s easy: price (Source: Nasdaq). The Holy Grail for shale gas enthusiasts is rising production and cheaper prices. In reality, however, what we have seen is rising production when prices are high, but stagnating production when prices fall. We haven’t really seen the same dynamic for tight oil in the US because we haven’t seen a prolonged period of falling prices–until now. 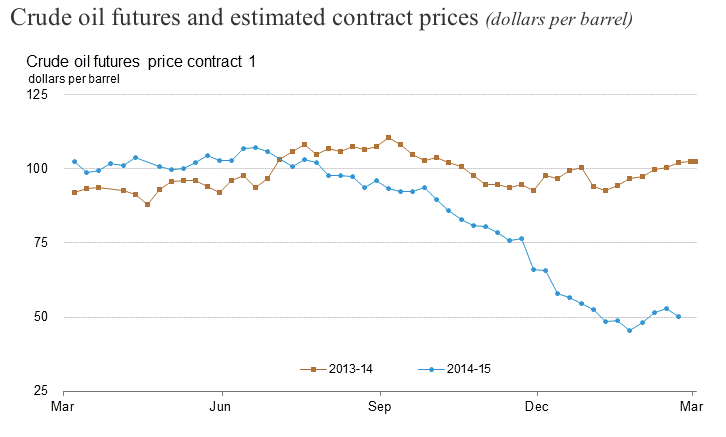 The chart is a little difficult to read, but the EIA is looking at $3.44 per million Btu in 2015 and $3.86 in 2016. This compares with an average of $4.39 in 2014. There are a lot of moving parts to the story. I haven’t touched upon the implications for associated natural gas (gas produced as a byproduct of drilling for tight oil) stemming from the oil price slump. Nor have I dealt with the big spat between the journal Nature and the EIA over shale gas reserve calculations. More to come on both of these topics in future posts. Overall, though, remember the “peak oil” theory is really one of peak cheap oil (see my posts here and here). and you can extend the same logic to gas. Consequently, the cornucopians have a golden opportunity to nail the peakists if they can show one thing: that the world can produce more oil and gas at the current low oil and gas prices. We have a testable hypothesis–let’s see what happens. Since the end of 2011, production growth has stalled (click chart below for larger image), with the year-on-year 12-month average bumping along a plateau. There was significant natural gas price volatility over the winter period due to unusually high gas demand prompted by periods of extreme cold. 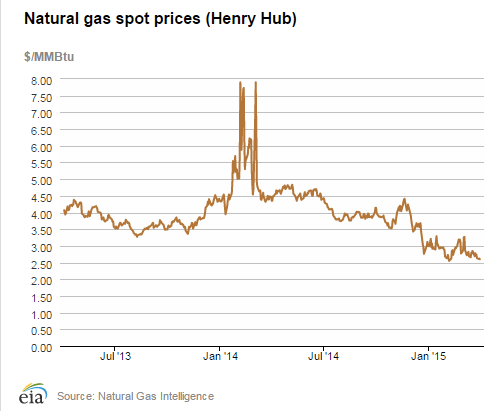 Critically, however, natural gas prices have remained elevated into spring at around $5 per million British thermal unit (Btu). 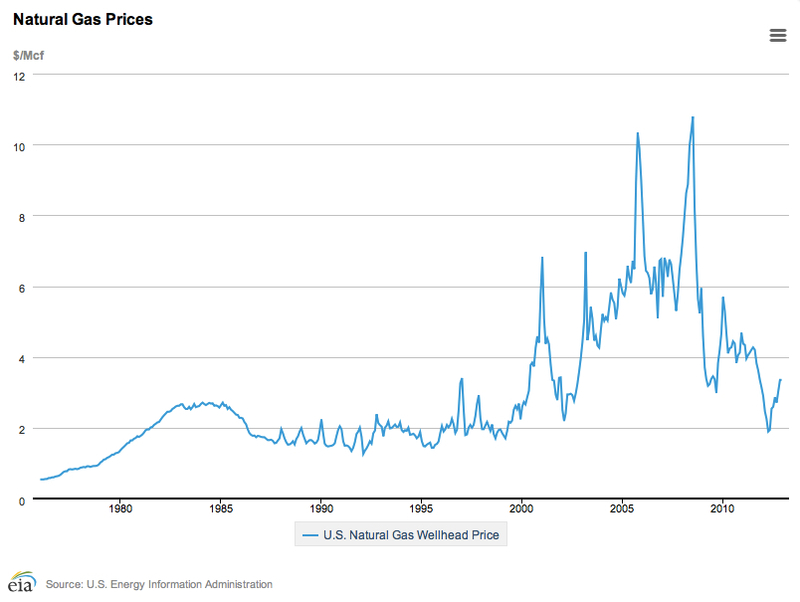 To put the current price of $5 in perspective, a long-term chart of natural gas prices is given below (click for larger image). Note that 1 million Btu is roughly equivalent to 1,000 cubic feet; the unit price is, therefore, comparable even though one chart refers to Btu and the other cubic feet. As can be seen in the chart, two natural gas spikes took place in the 2000s, with the price temporarily moving above $10. However, the average price for the period was between $5 and $7. The current well head price has now moved into that zone. Adjusting for inflation, the current price is still cheaper than the price in the late 2000s—but not that much cheaper. 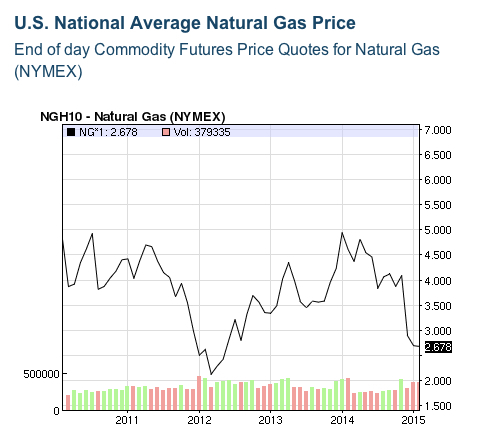 Much commentary on natural gas compares the 2012 price lows of around $2-$3 dollars with the $10 highs of the 2000s. This is very misleading and obscures the fact that shale gas is expensive to produce. My definition of a product revolution would be one with lower price and higher volume—integrated circuits being the classic case. Shale gas does not fulfil this definition. When price falls, production growth struggles; only with high price do you get production uplifts. Nonetheless, despite U.S. gas prices trending above $5, the U.S. spot price remains significantly below the price in other markets as the chart below shows (taken from BG Group presentation here, click for larger image). 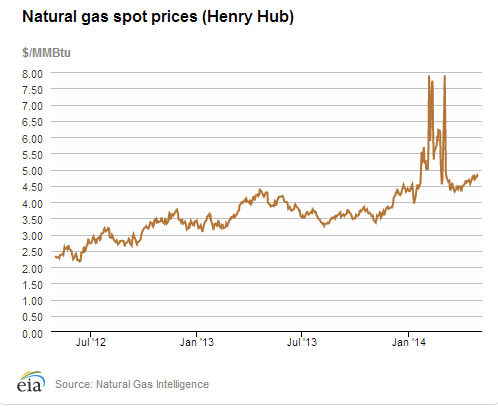 Note that NBP refers to the ‘national balancing point’, the benchmark wholesale spot price of natural gas in the UK. Until liquid natural gas (LNG) production and export facilities come on stream in the U.S., traders cannot arbitrage between domestic and international markets, so the divergence in prices will remain. When such facilities are available, the critical question is whether U.S. production can be ramped up to allow exports, and whether the volumes will be significant enough to impact on global market prices. 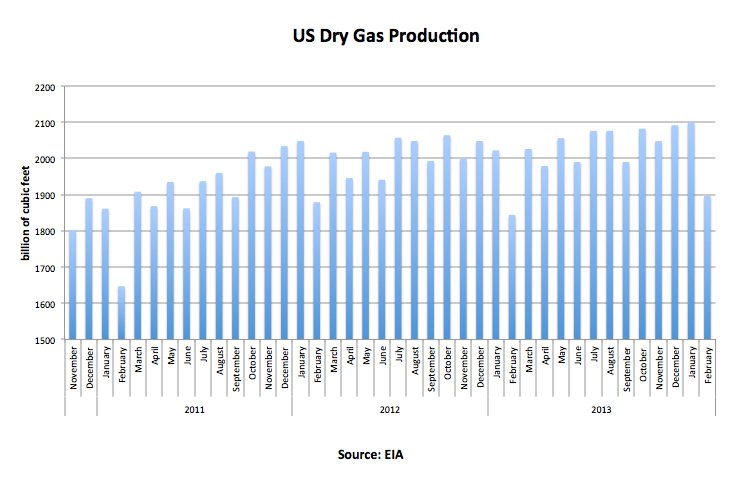 The US government agency the Energy Information Administration (EIA) issues data on U.S. natural gas production, including shale gas, on a monthly basis with a lag of roughly two months. 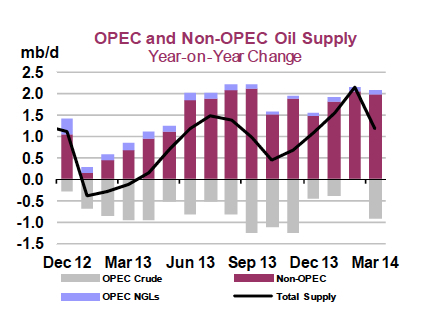 The latest data release was made on January 31st, and covers the period up until end-November 2013. 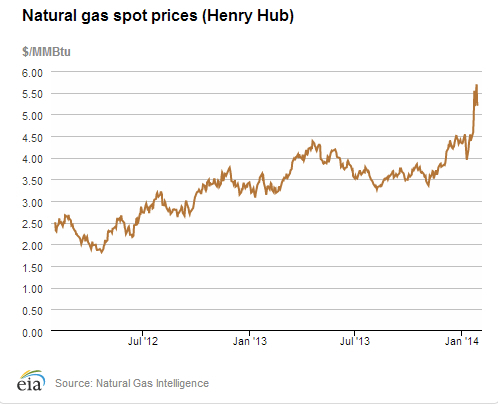 Natural gas well-head prices exhibit seasonality, with winters generally seeing stronger prices due to heating needs. The recent polar-vortex induced cold snap in the U.S. has pushed prices up to their highest since February 2010 (here, click for larger image). To put the current price of $5.5 per million British thermal uni (Btu) in perspective, a longer term monthly time series going up until end December 2012 is given below (click for larger image). 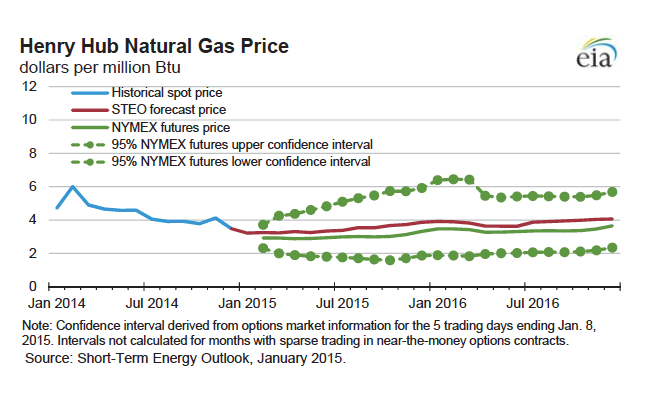 Note that natural gas production is very inelastic over the short term. Accordingly, the market is brought back into equilibrium during periods of strong demand through large jumps in price. However, these don’t generally prompt an investment surge in natural gas infrastructure since they are viewed as temporary in nature. 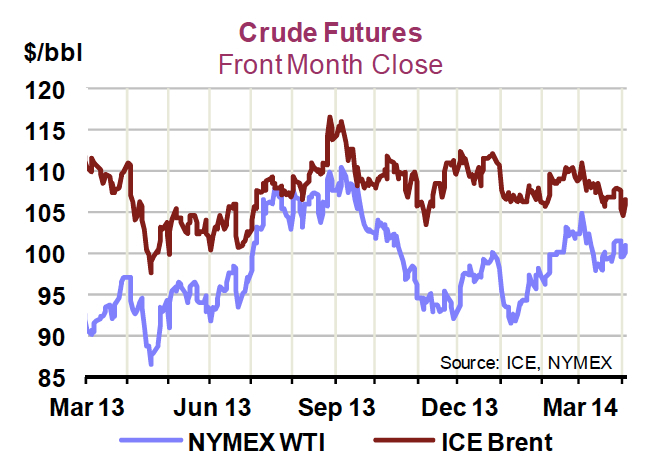 Only if prices remain elevated beyond winter would we likely see a supply-side response.